Industry leader for extremely robust and reliable license-free transfer, the Data Connect SWM910A provides up to 115kbps serial communications over distances up to 60 mile (100km). Flexible configuration options allow for various network technologies. Data Connects Proprietary radio technology excels in the most demanding RF and physical environments. 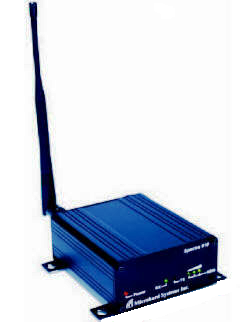 The Data Connect SWM910A is easily configured through a convenient AT Command Set interface. Users have the ability to deploy a wide range of network styles including repeaters and multipoint. The master site can diagnose the performance and modify the operation parameters of any remote slave unit. The following are application for the SWM910A. The Data Connect SWM910A provides a very high interference and noise rejection allowing reliable communication in high power cellular and paging environments. The repeater units can also act as a slave with no restrictions on the number of repeaters in the system. Internal CRC and user-selectable forward error correction ensures reliable transmission.